Today we are talking green juice. Wait! Before you make a sour face, give me chance to explain. 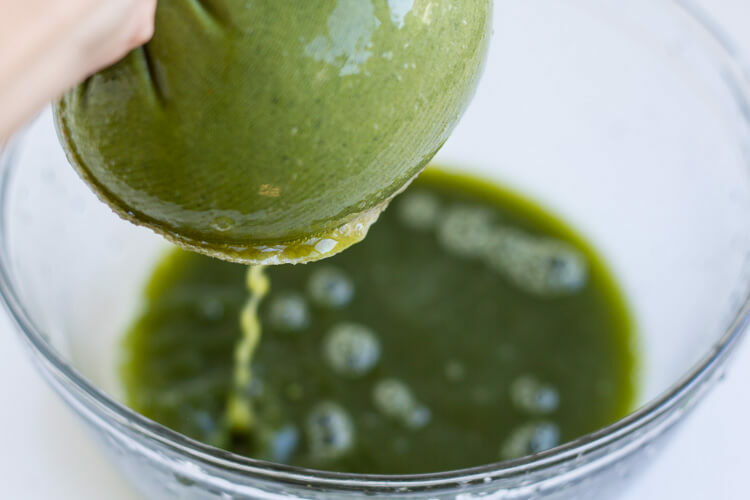 Not all green juices are created equal. 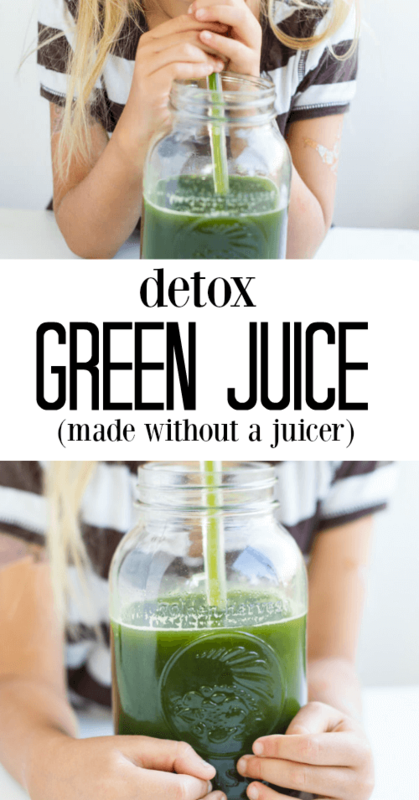 I’m going to share with you a simple, refreshing, and delicious detox green juice to that will give your body a blast of vitamins and minerals that you will want to make again and again. Many of you know that I am on a serious healing journey, and daily self-care is major part of that journey for me. One of the things that I do every morning is to make a green juice to give my body a concentrated dose of vitamins and minerals. If you follow my blog, you already know that I am not a fan of fad diets or crazy body cleansing. But one thing that I know is that our bodies can all use a bit of support when it comes to detoxification. Giving your body a huge dose of phytonutrients (plant chemicals that have protective or disease preventive properties) is a great way to promote the body’s natural ability to detoxify, especially if you are going through a healing journey like I am. Environmental pollutants are on the rise. Detoxing can help you shake sugar cravings. Detoxing can help improve your digestion. Detoxing can improve the look and feel of your skin. 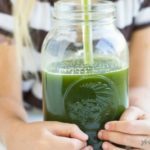 For me personally, I drink my daily green juice to support my liver. Having and treating Lyme disease makes this extra important. Lyme disease is often one of those things that gets worse before it gets better. And I am in that phase. Think headaches, brain fog, lethargy, and fatigue. Not fun. Keeping my liver in tip top shape helps my body with the extra heavy burden of die-off and neurotoxins that come along with treatment. But you don’t need to have a chronic illness to benefit from detox green juice. Because of our lifestyles and the world we live in, our livers are overburdened with the daunting task of detoxifying every thing you put in it. Giving your liver a little extra love in the morning is a good thing. 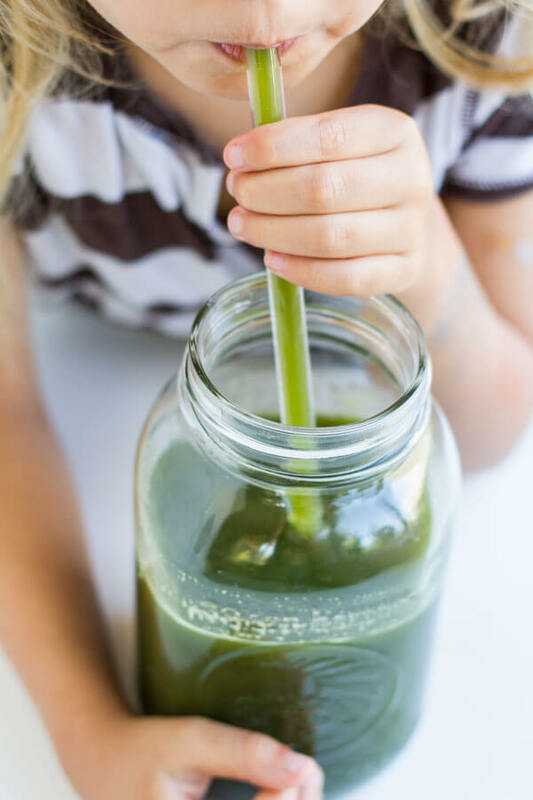 NOTE: Drinking this green juice is NOT a substitute for healthy, clean living. It is a tool to help our body’s own natural detoxification processes function better. You cannot out-juice a bad diet or unhealthy habits. Keeping your elimination systems working properly is essential to vital health. 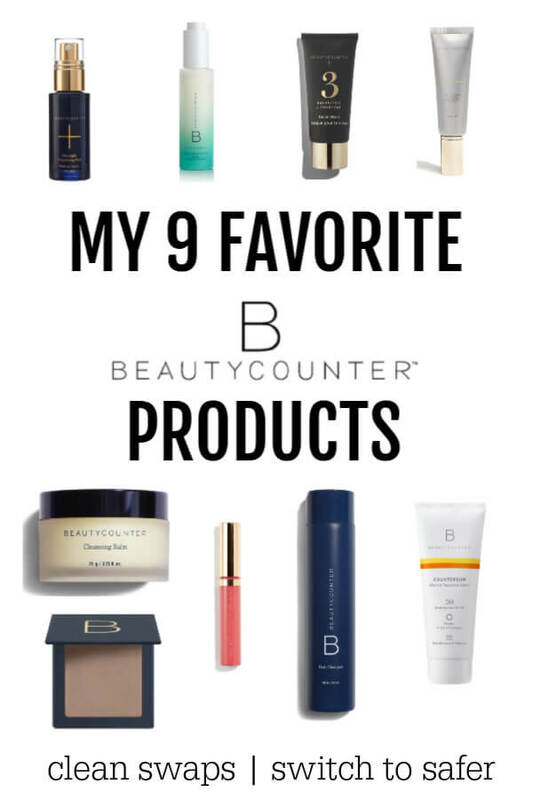 Be sure to check out my post on 6 Gentle Detox Routines for Better Health. I also do not recommend juicing as a meal substitute. Remember that many of the vitamins in juice are fat-soluble, meaning that they need a bit of fat to be able to be assimilated into the body. For this reason, I usually follow my green juice with a big breakfast full of healthy fats. My detox juice recipe is simple. It’s almost always the same, with a few additions here and there for variety. The goal is to get as many nutrients into my body as possible. Romaine is my go to lettuce green for juicing because it produces a lot of juice. It’s a powerhouse of vitamin A and C (antioxidants and immune boosting), Vitamin K (bone building), Vitamin B plus folate (for cell repair), potassium, manganese, and lots of other essential minerals. The antioxidant properties of romaine help to decrease inflammation in the body and to fight off free radical damage. Red and green leaf lettuces can also be used. I don’t recommend iceberg lettuce as it is mostly water and does not have mush nutritional value. Cilantro is a rock star when it comes to detoxifying. 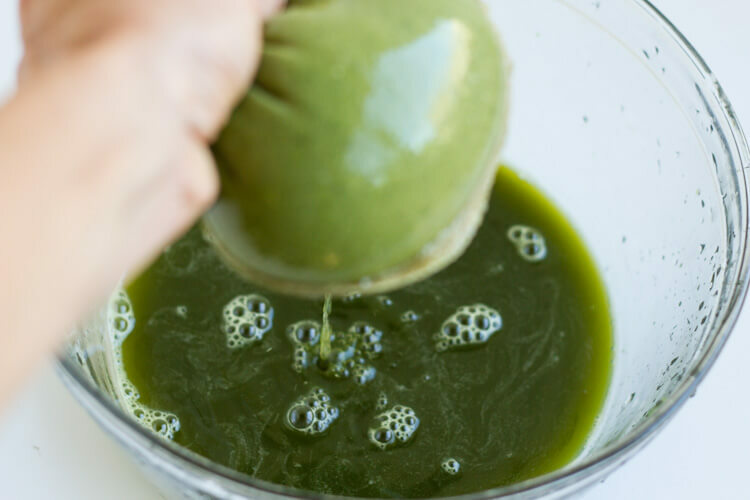 It is well-known for helping rid the body of heavy metals which can cause many health issues in the body, especially for those with chronic illnesses. Along having powerful antioxidant, anti-inflammatory, and antimicrobial properties, it is a very good source of vitamins A, C, K and traces of the B vitamins. Be sure to use both the stems and leaves. Celery juice is highly nutritious and one of the most hydrating foods we can put in our bodies. Think electrolytes. 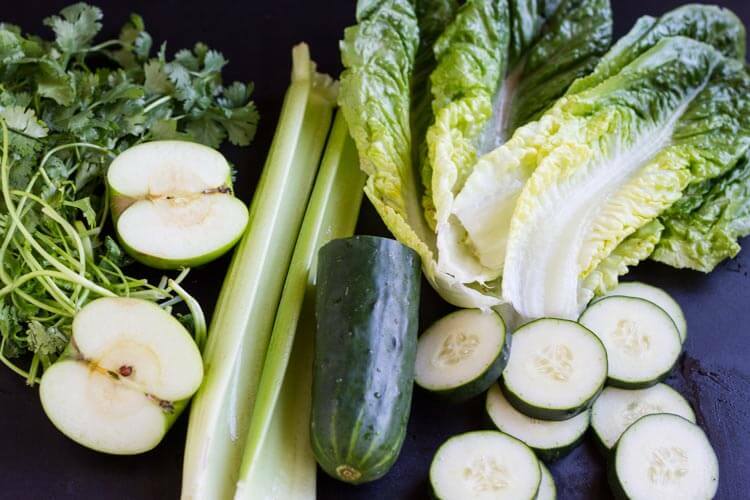 Celery leaves are high in vitamin A, and the stems are an excellent source of vitamins B1, B2, B6 and C and dense in potassium, folic acid, calcium, magnesium, iron, phosphorus, sodium and essential amino acids. Think hydration. Cucumbers are 95 percent water, keeping the body hydrated while helping the body eliminate toxins. They provide vitamin K, vitamin C, beta-carotene and manganese plus phytonutrients such as flavonoids, lignans and triterpenes, which have antioxidant, anti-inflammatory and anti-cancer benefits. Don’t forget to leave the skin on because the skin contains a good amount of vitamin C.
I usually throw in a piece of fruit for a bit of sweetness. 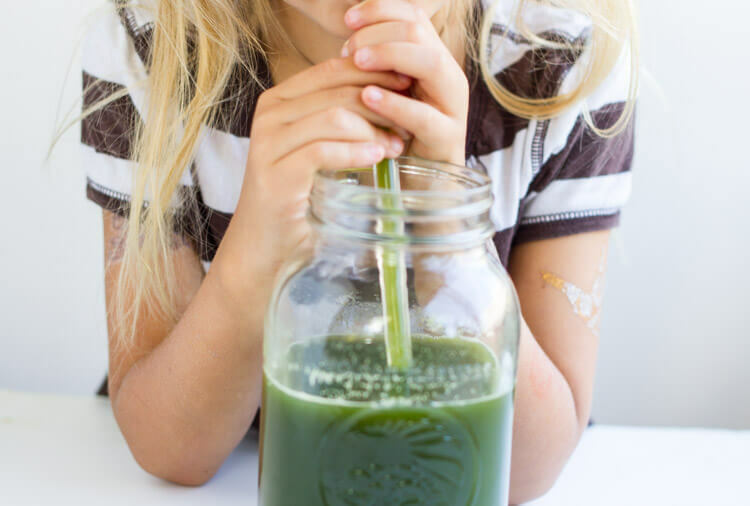 Personally I don’t mind a super “green” tasting juice, but Little One is more likely to drink her green juice if I add an apple. Green apples tend to have the least amount of sugar, but any apple will do. I know that raw kale is a very popular ingredient in green juices. I, however, do not like to juice raw kale as I don’t feel like I digest it very well. I prefer it cooked. Raw kale is also known to be goitrogenic, which means it affects thyroid health. Good to know if you have any thyroid issues. I used to own a juicer many years ago. Currently I do not. Instead of forking out the big bucks for a fancy cold press (masticating) juicer, I have decided to make due with using my high speed blender. I already own it, it’s easy, it’s fast, and it requires very little clean up. THIS is the one that I have. I recommend using only fresh, organic produce for juicing to get the most nutrients and to avoid the harmful toxins and pesticides that we are trying to rid our bodies of. Avoiding heating the juice as you process it will ensure that the maximum amount of nutrients are available to you. If using a juicer, I highly recommend investing in a cold press ( or masticating) juicer. These juicers extract juice by first crushing and then pressing fruit and vegetables for the highest juice yield. Because they don’t produce as much heat, they keep more of the fresh ingredients’ nutrients intact. I’ve heard good things about THIS one. 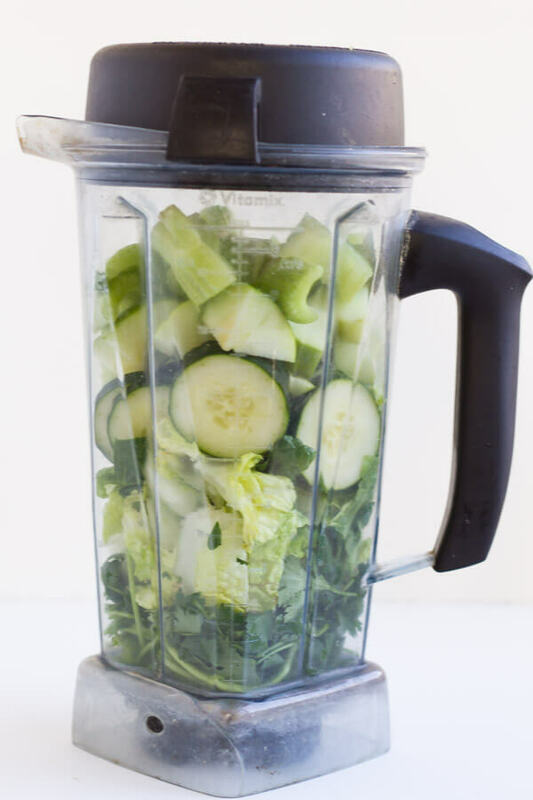 If using a high speed blender, adding a few cubes of ice to your blender jug while processing can help keep juice cool. If your high speed blender comes with a tamper tool, use it to push the produce down while you process. To make straining my juice easy, I like to use a nut milk bag. 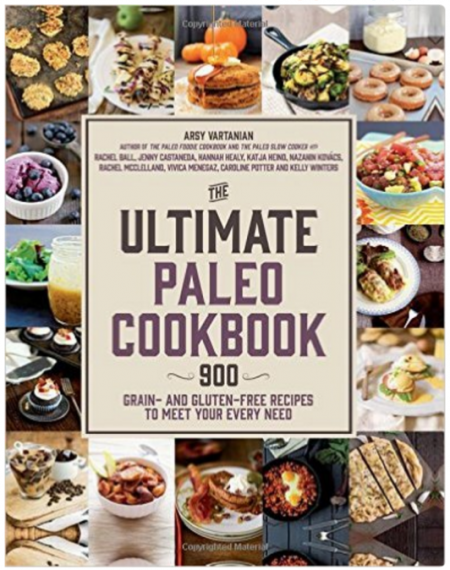 They can be purchased at health food stores or online HERE. Wash all ingredients and run through juicer. Drink immediately and enjoy. 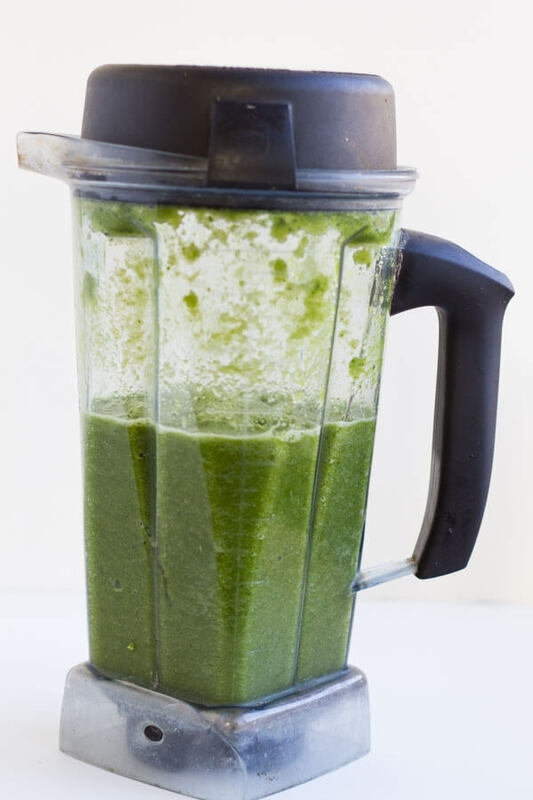 If using high speed blender, wash ingredients, chop into smaller pieces, and place into blender jug in the order listed in recipe, adding 1/2 cup of water or coconut water. Start on lowest setting and slowly increase speed to highest setting. I use my tamper attachment to push the produce down. Blend until smooth but not warm. Strain through a nut milk bag. Drink immediately and enjoy. 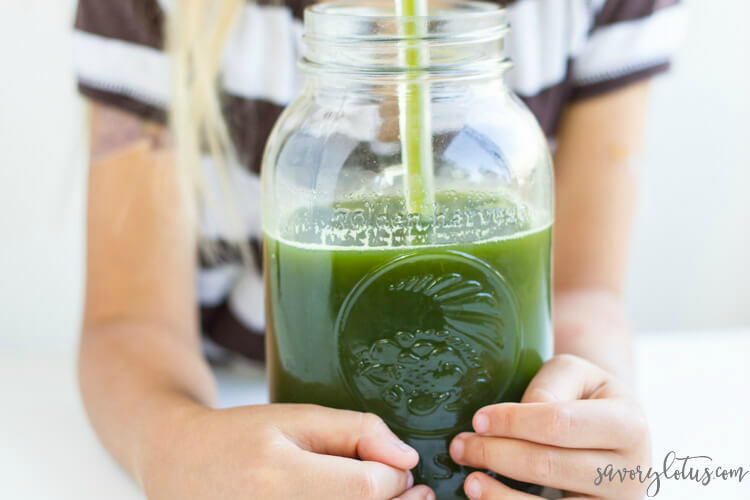 Do you have a favorite green juice recipe? Please share! what a awesome idea using a blender for a juicer. Now that I’ve read your article it seems so obvious and simple! Duh. Thanks. I also found it comical that you substitute the seasonal apple with a pear. I could be wrong but I thought that apples and pears were of the same season ? Any who I’m excited to try out this juice. ✌??? Can I quadruple the recipe and store in the fridge several days so I don’t have to make it everyday? Juice like this is best made fresh every time. It loses potency as time goes by. Hi Katja, I’m excited to try this out! Does the juice need to be strained though? Can I drink it with the fibers still in? You can totally drink it with the fiber in it. I do that with juice sometimes too. Is this to detox the liver .